The “battle of the bands” festival is produced by a committee of dedicated music industry young professionals from Loyola University New Orleans. The goal of the event is to bring together the Uptown college community with the local residents for an energetic fun-filled day of entertainment. 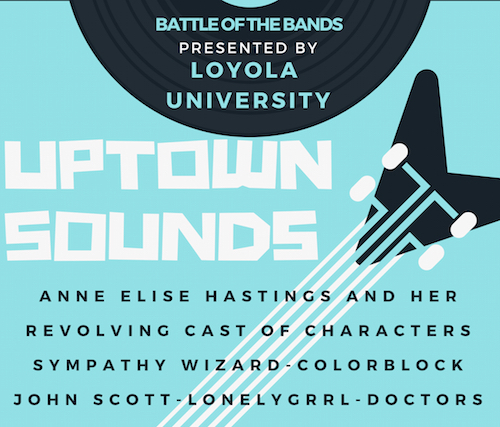 The competing bands are Anne Elise Hastings and her Revolving Cast of Characters, Sympathy Wizard, Colorblock, John Scott, Lonelygrrl, and Doctors. Festival goers will vote for their favorite act of the day, and the winner will perform at the Freret Street Festival on Saturday, April 6. There will be samples of Big Easy Bucha and free bags of Chee Wee’s (for the first 300 people). Beer, wine and water will be sold, and food trucks will be at the site. The festival takes place form 2 to 7 p.m. this Sunday. It is free and open to the public. Attendees are encouraged to bring folding chairs and picnic blankets. 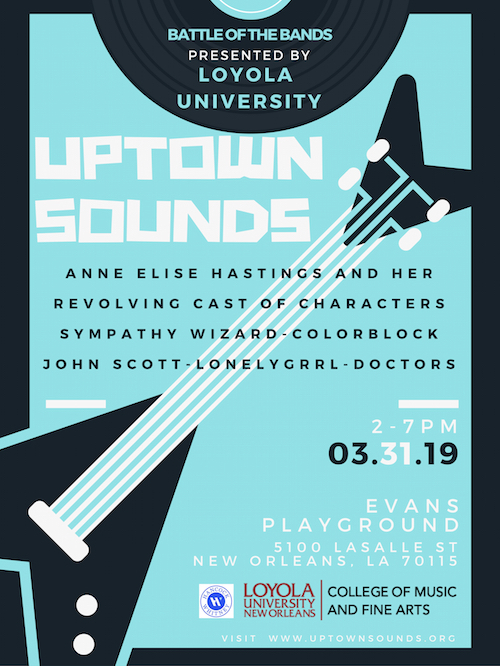 Visit Uptown Sounds for more information.